It was standing room only at St Mary’s Church on Sunday 15th December when the village held its annual Carol Service. 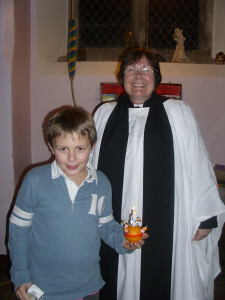 The service follows the traditional format of 9 lessons and Carols, but this year incorporated a Christingle element. The children made their Christingles during the first part of the service and processed to the front of the Church during “Away in a Manger”. The children, whilst holding their lit Christingles, then each said a few words about the Christingle story and what the different parts of the Christingle mean. The retiring collection raised £131.65p for The Children’s Society. The service was followed by light refreshments including mince pies and mulled wine. The church wardens would like to thank everyone who attended this event, all the readers, and everyone who helped to organise the service or donated refreshments. Pictured with his finished Christingle is Oliver Baggott (age 9) with Rev’d Fliss Iliffe.